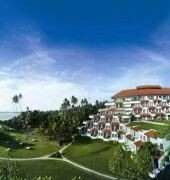 Vivanta By Taj Bentota is a 5-star hotel located on the south west coast of Sri Lanka's Galle District and a 62 km drive from Colombo. Guest rooms feature a private terrace or balcony with views of the garden or the Indian Ocean and equipped with LCD TV with satellite channels, direct dial phone, mini bar, tea/coffee maker, electronic safe, WiFi access and a private bathroom with tub and shower. 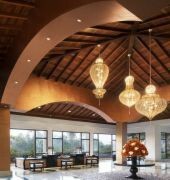 The hotel offers a choice of 4 restaurants serving local and international dishes. In addition, the bar offers a wide selection of beverages with live entertainment. Recreational facilities include an outdoor pool, Jacuzzi, sauna, steam room, table tennis, volleyball, pool tables, 24-hour fitness centre and a full service spa offering a broad range of wellness therapies, beauty treatments and massages. Sightseeing tours and water sports activities can also be arranged on request. Other attractions in the area include the Bevis Bawa (Brief Gardens), Galapata Vihara and the Sea Turtle Hatchery.